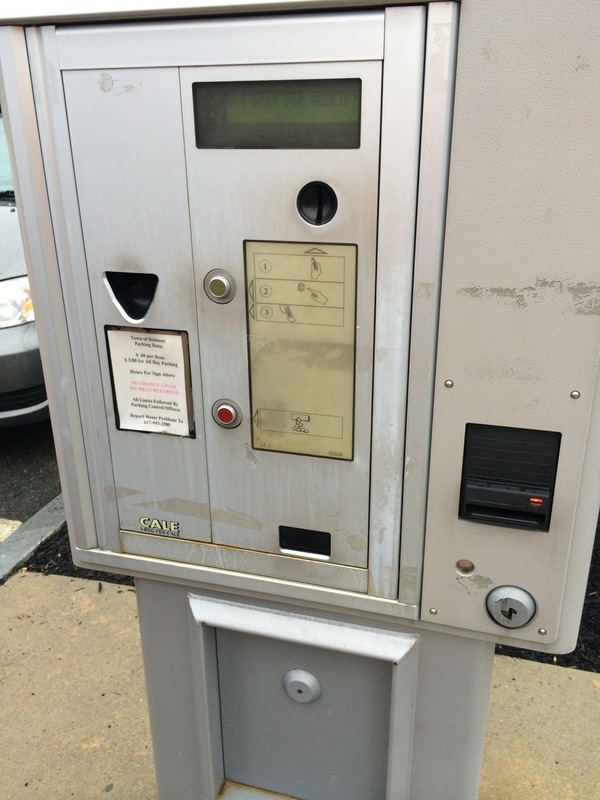 It’s easier for a municipality to have central machines that dispense tickets for parking than to have individual meters. But they’re not always designed well. Here are two examples, one easier than the other. Neither takes credit cards, which complicates the UI in other machines. The first one is in Belmont, Mass. While the display is a bit dim, it’s very easy to use. The next one is in the neighboring town of Arlington, Mass. They put all those stickers on the machine because it’s so hard to use otherwise. Even the coin slot is labeled! When I was at the farmers’ market last summer, I saw a town employee who took people’s money and ran the machine for them. That’s an expensive side effect of poor design. Parking machine in the town lots in Belmont, MA. It’s a little hard to read, but easy enough to use. 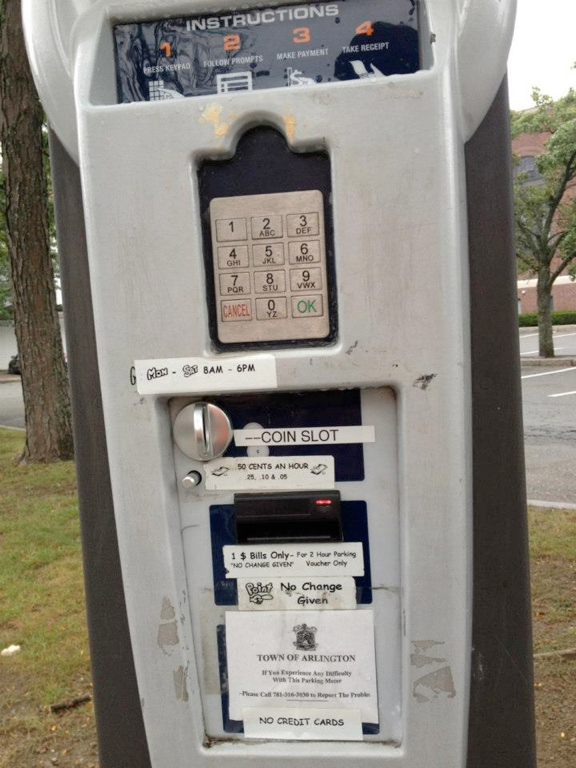 Parking machine in the town lots in Arlington, MA. All those stickers are supposed to help with the UI. What do you think? Soap on the right, water on the left. How do you use them? After pressing the top of the soap dispenser, I pressed the top of the faucet. Nothing. 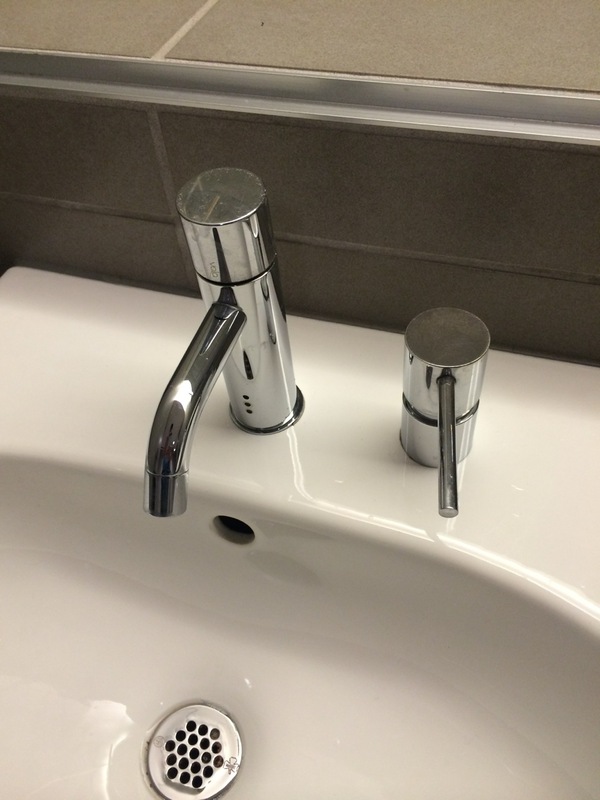 I see now that the three little openings at the bottom of the faucet stem indicate a sensor, but I was going to wash my face and didn’t have my glasses on. It’s a lovely design, but the inconsistency confused me. Each time I visited the Museum of Fine Arts and used this bathroom! I think now that I’ve written this post, I’ll remember! How do you get soap? How do you get water? Pressing issues: How do you use an elevator? 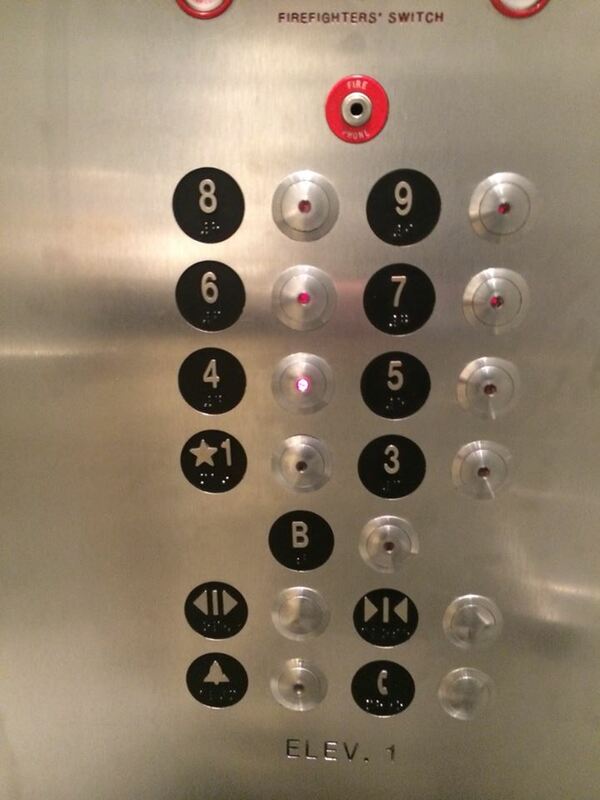 I rode in this elevator multiple times recently, and each time pressed the numbers instead of the buttons. It’s not an unusual design, but to me, the floor numbers always stand out much more than the buttons. Have you ever had that problem? Quick: What do you press? At the time, I didn’t even notice that there’s no second floor! We had some contractors in the house recently. I noticed that one of them had a cordless drill with a tray holding the screws he was going to use. I asked him about it and he said that it was magnetic and held the screws until he needed them. The tip is also magnetic, so the screw he was putting in wouldn’t fall out. He also liked that there’s a bubble level on the top, so he knows if he’s putting the screw in right. Features like levels, magnetic trays and magnetic tips are important to users like contractors who use a drill constantly. These features come from good customer research. I was visiting at a senior living community lately, and saw a great low-tech security device. … and when the resident opens the door, the marker falls. Security staff walk through the halls during the morning and can check on anyone whose marker isn’t released. Do you write comments online? Commenting is available all over the Web. It’s a great feature, but there are some things that can hold people back from using it. People are concerned about what others will think of them. Unless you’re really sure of your point, questioning someone online, especially an expert, can seem scary. I’ve heard participants say that in usability studies. Because people don’t want to damage their reputation or their professional status in the community, they won’t post unless they’re fairly sure that their contribution will be received as a contribution and will not open them up to critique. He suggests demonstrating “how [members] can ask questions productively” and in general, creating a safe and comfortable environment. Online, people everywhere are willing to insult people’s mothers at the drop of the hat. Anonymity leads to people saying a lot of things. So basically just being exposed to rude comments, even if the content of the comments themselves was the same, made people react differently to the content of the story. So the question is therefore: What do we do to encourage better understanding? … And then we should discuss what does it mean to have a civil discussion online. Systems like Facebook and LinkedIn certainly allow people to comment on their own lives and other people’s posts, and they’re obviously popular. It may feel safer in those systems because you only sign up if you want to do it, and you have a controlled audience (depending on how well you understand and use your privacy settings). The commenting UI itself sometimes gets in the way, as I saw in a usability study awhile ago. The commenting form might appear at the top or bottom of the article. It’s not useful at the top, because you haven’t read anything yet. You might not get to the bottom to see the form there if you don’t read the whole article. And if you print the article to read, there’s no easy way to post a comment. Having a link float on the page so it’s always visible might be helpful but requires careful testing to see how people react to something that keeps moving. In a system with a lot of topics (whether they’re courses, articles or products), many items may have few or no comments at all. That may make them look unpopular. Seeding a discussion, by having a staff member or the author post the first comment or question might help it look less like a vacant lot and more like a conversation. I belong to a professional email list that is for members only. That restriction is useful; it’s one of the things that the moderators do to make people comfortable. Even though most of us will never meet, we have a definite sense of community from having helped each other on topics of mutual interest. In one recent study, a man indicated that he writes comments in an online course’s discussion area. When I asked for details, it turned out that he hadn’t written anything at all. He was really talking about what he might do, not what he actually does. (That’s why it’s important to not simply accept what people say in customer research and usability studies.) He prefers to talk with friends who also take the class; it seemed that he was just more comfortable with people he knows. …In what situations do you post comments, if any? What makes you nervous or comfortable about doing it? Should we moderate comments, or let anyone say anything? Is it different if it’s social or professional? And don’t worry – I moderate the comments here and won’t let anyone be rude. Security questions: helpful self-service feature, confusion, or security risk? Question: What was your favorite teacher’s youngest child’s first pet’s name? As part of account creation, many sites require you to answer secret questions. This isn’t only for security. It provides a self-service way for you to reset your password, which is easier for the company, and maybe for you, too. (Remember when you used to call customer care for things like this?) But security questions can be hard to design and use. “Where was your first kiss?” I’ve seen this make some people laugh, but embarrass others. “What’s your favorite …?” Preferences change often, so answers are hard to remember. “What was your phone number growing up? Let users know if hyphens, parentheses and spaces count. “What’s your youngest child’s first name?” If you have another child later (or have none), this won’t work. Marriage dates, location or attendants. Not everyone is married. Pet names or types. Some people don’t have pets. Here are some real examples from 2012, when I wrote this post: the first is from Yahoo.com, the second from BarnesAndNoble.com. How many questions could you answer now and remember later? How many just leave you scratching your head? The reality is, security questions present an opportunity for breach and even the best security questions are not good enough to screen out all attacks. There is a trade-off; self-service vs. security risks. People who know you may know enough to answer your questions; people who don’t know you may be able to find out the answers (how many people on Facebook and LinkedIn know what schools you went to?). One of the most interesting ideas I came across is to answer a completely different question. You might use “green polka dots” when the question is “What street did you grow up on?” That’s harder for someone to guess, but harder for you to remember unless you use it everywhere (which isn’t secure). Danah Boyd, writing on Apophenia, suggests combining a “snarky bad attitude phrase” with a clue from the actual question, plus a unique word. For example, she writes “when I’m asked the following question: What is your favorite sports team? My answer would be: StupidQuestion SportsTeam Booyah“. It’s OK to have some questions that don’t apply to everyone, but have enough choices so everyone can comfortably use a few. Questions shouldn’t be so obscure that people have to write their answers down. Answers shouldn’t be too easy for someone to figure out. Answers should be unique — there should be just one. Answers should be stable over time, unlike favorite things. Have reminders about punctuation and case, both for initial and subsequent entries. Consider allowing people to specify their own questions in case none of the provided ones work. It may seem trivial to test security questions, but it does help. We got some good feedback in a recent project and changed the questions in our list. There’s nothing like showing your work to real users.